"Tasty grilled eggplant complements the flavors of goat cheese and roasted red pepper in this 'couldn't be easier' recipe that is good served hot, cold, or as leftovers. To re-warm, place on low-heat grill for 2 minutes." Arrange eggplant slices on a large plate and sprinkle both sides with salt. Refrigerate until water has been drawn out, at least 30 minutes. Rinse eggplant slices and pat dry with a paper towel. Lightly brush both sides of eggplant slices with olive oil and season with Italian seasoning. Grill eggplant slices on the preheated grill, exactly 3 minutes per side. 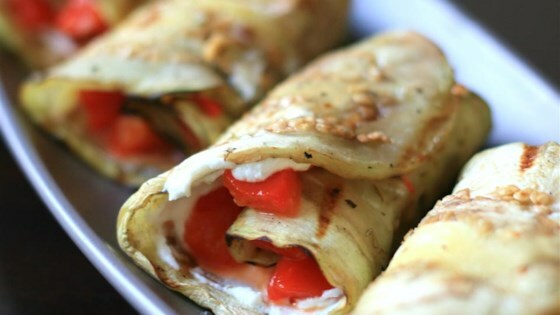 Spread goat cheese on 1 side of each eggplant slice and sprinkle with roasted red peppers. Serve open-faced or rolled up. The grilled eggplant is delicious, however, we did not like the combination of the eggplant with the goat cheese & pepper. I will definitely grill the eggplant like this again and serve it plain. Had to substitute cream cheese for the goat cheese. Thanks for teaching us how to grill eggplant. We added garlic and Asiago cheese. Looks as elegant as it tastes.